Compact light weight Table top with easy operations. 300mm diameter screen with 90° cross line and chart holders. Screen is graduated to 360° with vernier reading 6 minutes. Projection Light Source with 24V / 150W Halogen Lamp. Double Oblique Light source for Surface Illumination throught 10 watt LED bulbs. Focussing can be adjusted manually by hand wheel. High Quality objective lenses. Optical distortion below 0.15%. Standard magnifications : 10x, Optional : 20x, 50x and 100x. Measurements available through Manual or Digital Micrometers. 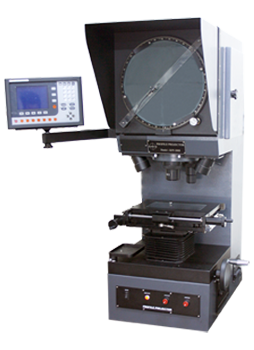 Optional Work Tables for Micrometer Heads and for linear scales. Cooling by built-in noiseless and vibration free fan. Available in 110V or 220V through low voltage transformers. Supplied complete with operating instruction manual. Optional Cabinet base metal stand. Rotary Measuring Stage Yes, Stage Glass dia. Dimensions/Weight 45x82x112cm /75 Kgs. 45x82x112cm /75 Kgs. 45x82x112cm /95 Kgs.